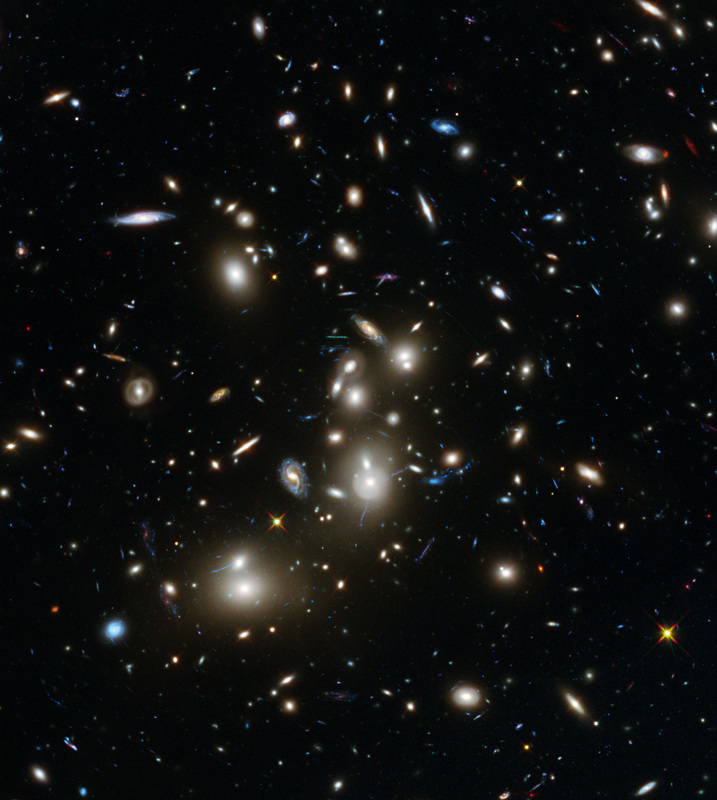 Abell 2744, Pandora’s Galaxy Cluster, from the Hubble Frontier Fields. Click through and get lost for a while. Were the Sun a grain of sand, Earth’s orbit would be an inch in radius, the solar system the size of a beach ball, and the nearest star another grain of sand four miles away. Yet even on that absurdly compressed scaled, the Milky Way galaxy would be a hundred thousand miles wide. Galaxies are so big that once you get up to their scale, the universe starts to take on an almost country-cottage intimacy. The larger galaxies in clusters like the Local Group, to which Andromeda and the Milky Way belong, typically lie only a couple of dozen galactic diameters apart from one another – comparable to dinner plates at the ends of a twenty-foot-long dining table. Add in the galaxies’ halos of stars, globular clusters, associated hydrogen clouds, and dark outer disks, and they almost impinge on each other. On the same scale, the Virgo supercluster, of which the Local Group is an outlying member, comprises ten thousand plates scattered across an area not much larger than a football stadium, and the entire observable universe has a radius of only about twenty miles. From a galaxy’s point of view, the universe isn’t all that large. 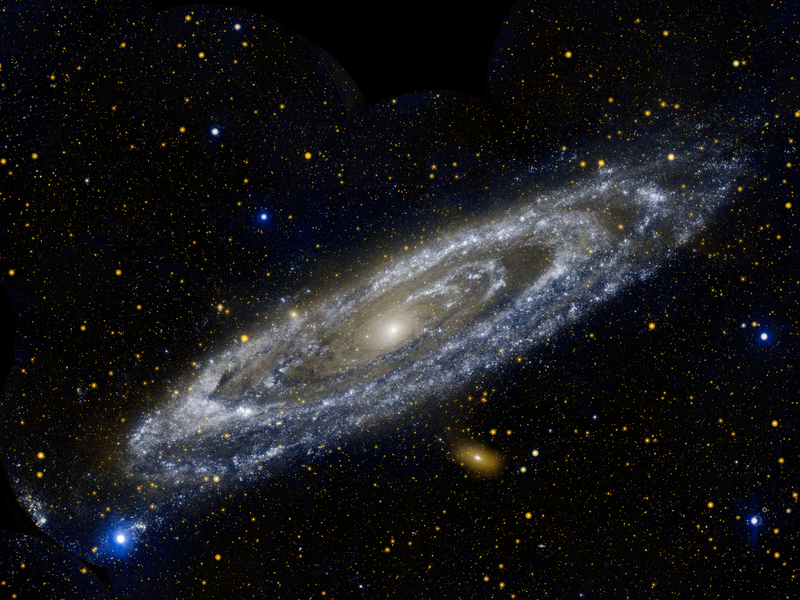 The Andromeda Galaxy in ultraviolet light, from NASA’s Galaxy Evolution Explorer. You want to click through for the full image – trust me. The trouble is that it’s difficult – probably impossible – for a human to make the mental leap to galactic scale. The very concept of space is inadequate for dealing with galaxies; one must invoke time as well. The Andromeda galaxy is steeply inclined to our line of sight, only fifteen degrees from edge-on. Since the visible part of its disk is roughly one hundred thousand light years in diameter, the starlight reaching our eyes from its more distant side is about one hundred thousand years older than the light we simultaneously see coming from the near side. When the starlight from the far side of Andromeda started its journey, Homo habilis, the first true humans, did not yet exist. By the time the near-side light started out, they did. So within that single field of view lies a swath of time that brackets our ancestors’ origins – and that, like the incomplete dates in a biographical sketch of a living person (1944-? ), inevitably raises the question of our destiny as a species. When the light leaving Andromeda tonight reaches Earth, 2.25 million years from now, who will be here to observe it? We think of Einstein’s spacetime as an abstraction, but to observe a galaxy is to sense its physical reality. …As objects of study, galaxies are bottomless. 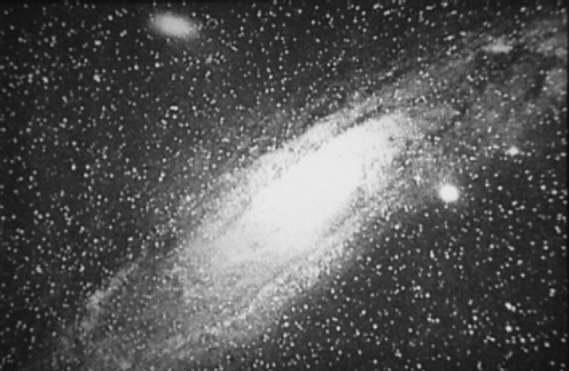 If we spent eons observing the Andromeda galaxy with ever better equipment, we would, presumably, learn a great deal – indeed, one hopes that this will happen – but there would always be more to learn, if only because so many things keep changing there. To pick a literally glaring example, it is estimated that more than fifty thousand stars have exploded in Andromeda in the past two million years: The light from all those supernovae is already hurtling through space toward our telescopes, part of Andromeda’s past and our future. A galaxy is not so much a thing as it is a grand, glorious exemplification of the scope of cosmic space and time. Yeah, that’s pretty sweet. I immediately recognised the Hubble image at the top — it’s cropped up in more than one of my sermons. To be fair though, when confronted by the sheer enormity of the distances between the stars, better minds than the one responsible for the Guide’s introduction have faltered. Some invite you to consider for a moment a peanut in Reading and a small walnut in Johannesburg, and other such dizzying concepts.